This diffused downstem ash catcher is a great addition to any water pipe. This ash catcher features a 45° male joint and is available in 14mm or 18mm. The ash catcher not only stops ash from getting into your water pipe it also adds another later of filtration to further cool down your smoke. Add this glass ash catcher onto any female jointed water pipe to take it to the next level. I bought the wrong size, but luckily had some adapters to use. It works great. Makes it that much smoother. I wasn't sure if this would be too big because I was putting it on a handheld but the price was really good so I gave it a shot. Not only does it fit but it also doesn't weigh much so my piece doesn't tip over which I was also a little worried about. 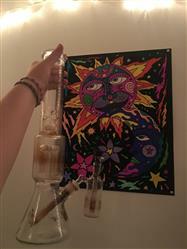 The only thing I will say is that you should put in such a small little tiny amount of water because if you pull too hard it can bubble up and then you get all that dirty water in your piece. But honestly I put in like the smallest amount and it works really well. A great addition to any piece to make cleaning sessions few and far between.